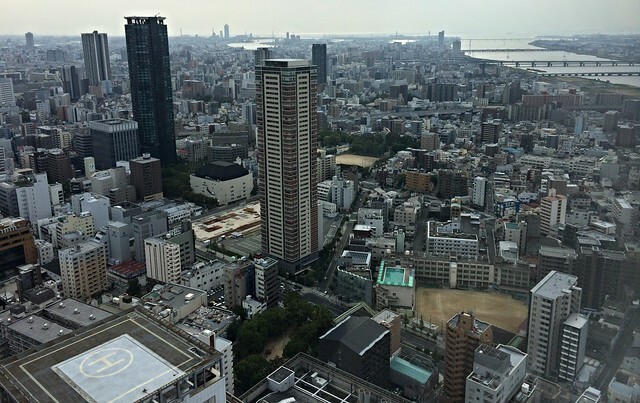 One of the biggest adjustments for me in our move to Japan is living in a very large city. The metropolitan area of Osaka – Kobe – Kyoto has a population of over 18 million people. That is larger than Moscow, Cairo, Los Angeles, and Bangkok and ranks #14 in the world, just below Mumbai. The three cities are known as Keihanshin and the GDP of this area is roughly the same as London or Paris. There is a lot of people here and a lot of money. The most populous metro area in the world is Tokyo with almost 40 million people. It has a population density higher than Bangladesh. I will certainly be exploring Tokyo in future visits. Although we live in a big metro area, we do not feel it on a daily basis. The school is located in the suburb of Minoh, which is 17 kilometers (10.5 miles) from the city center. By train it is about 20 minutes. We live only a few blocks away and it is about a 5-minute walk to school. 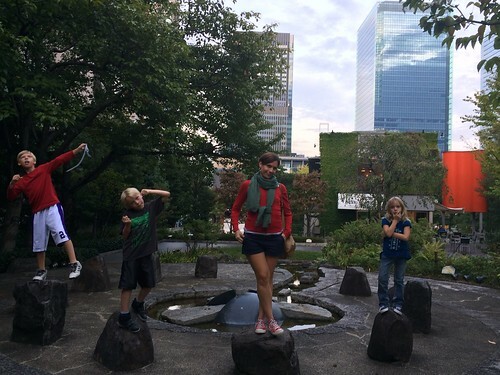 Minoh is full of parks, wide sidewalks, bike paths, and is minutes away from the forested hills of a “quasi national park” so one gets the impression of living in the suburbs of any city. The only time we get a sense of the vastness of Keihanshin is when we take the train into the center or go over to Kobe. The apartments, houses, and businesses go on endlessly. 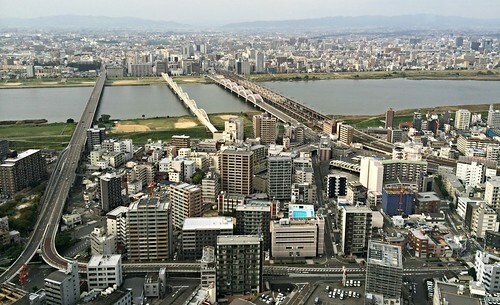 Our goal yesterday was to get to the top of the Umeda Sky Building. 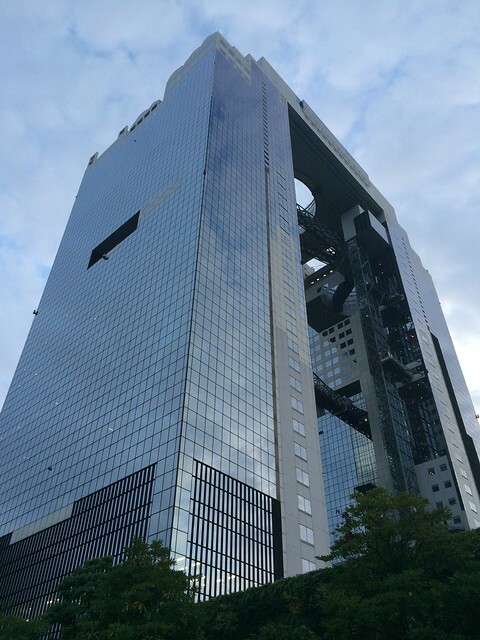 This is an Osaka landmark, built by Toshiba in 1993. During the heady real estate boom of the late 1980s they had originally wanted 4 interconnected towers, but only built two. In between the two towers at the top, there is an outdoor observatory, an escalator on one of the top floors leading across the open space, and modern sitting area with restaurants and cafes. The views are spectacular. They really helped me see how big Keihanshin really is. It goes on forever with hundreds of skyscrapers, all the way out to the Osaka Bay. Around the Sky Building, there are some parks, wide walkways filled with cafes, restaurants, and shops. It is very pleasant, except when one gets closer to the Umeda train station, as there are too many people for my taste in that station. We had dinner in the basement floor of restaurants. In Japan, it is common for entire floors of buildings or train stations to be devoted to restaurants and bars. There were probably 20 different restaurants to choose from. We chose an Indian restaurant and it was really good. I recommend a visit to the building. The architecture is interesting, it is a really nice area, and the views, especially at night or at sunset are beautiful. It gives one a good sense of the layout of the city. Growing up in a small town of 900 people in a very rural and isolated part of northern MIchigan, living in a city that has twice as many people as the state of Michigan, is going to take some getting used to. In some of my previous postings overseas, I have lived in cities of around 2 million (Perth, Santa Cruz, Barranquilla, Belgrade) but never this big. Be sure to splurge for some of that kobe beef…amazing stuff!